Frank Mowbray Luce was born in Cheltenham in 1878, the son of a clergyman, and the fourth of thirteen children. He spent his early childhood at 47, London Road, Gloucester, but by the age of 12 he had been sent away from home to school at Lindley Lodge private school at Higham-on-the-Hill, Leicestershire. He continued his education at Cheltenham College, where he was a contemporary of G F Collett. Luce went off to OxfordUniversity, whilst Collett went to Oxford, and both won Blues for rugby. They both played for Gloucester at centre three-quarter. Luce played his first game for Gloucester away at Swansea on 15th January 1898, aged 17, alongside Collett. During that 1897-98 season, Luce made 12 appearances and scored 3 tries. He seems to have taken a particular liking to Weston-super-Mare, scoring his first two tries for the Club against them on 19th March 1898 during a 50-0 drubbing at Kingsholm, and another in the 23-3 win in the return game at Weston later in the season. In his end-of-season review in the Citizen, WB commented “In the last ten or dozen matches, F M Luce, the old Cheltonian, was drafted into the team, and he certainly shaped very well without performing brilliantly.” He also won a County cap for Gloucestershire in a friendly against Glamorgan at Cardiff on 7th February 1898. In 1898-99, he made 13 appearances and scored two tries. Although Luce and Collett only played together in 3 games for Gloucester this season, they did both play on 14th January 1899 in the famous first victory over Llanelly at Stradey Park. As news of this result filtered back to Gloucester, a large crowd gathered at the Cross. Although the team did not arrive back at Gloucester station until midnight, they were greeted by a brass band, and the players were carried shoulder-high through the City. WB’s summary of this season included only: “F M Luce and G F Collett were found useful early in the season”. 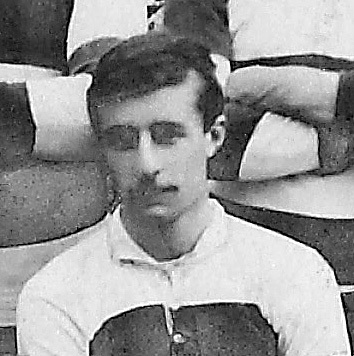 Luce did not appear in 1899-1900, but made 4 appearances in 1900-01, scoring a try in the 25-0 defeat of Treorchy on 29th December 1900. That was to prove to be his last try for the Club. However, he received an honourable mention by WB in the Citizen in his end-of-season summary – “during the season…F M Luce rendered most useful assistance as a reserve”. By the time of the 1901 census, he was a probationer for the Indian Civil Service, and staying as a visitor at 42, Oxford Street, Gloucester. He made a solitary final appearance for Gloucester in 1901-02 on 2nd November 1901 at Stroud. His career record was 30 appearances and 6 tries. Reminiscing in 1946 about the four very successful seasons enjoyed by Gloucester in 1896-1900 under the captaincy of Walter Taylor, WB wrote in the Citizen that “players who figured prominently with the captain in the many successes recalled, included … F M Luce and G F Collett (both of whom gained Blues at Oxford and Cambridge respectively)”. In 1911, he is recorded in the census as working for the Indian Civil Service, Bengal Division, but living at Longford, Gloucester. By then he had married Cecily Catherine from Mickleton. He died in Berkshire in 1962, aged 84.